Before that time, the idea of exploring the unknown depths of the ocean was met with significant trepidation, notably throughout the Middle Ages. It wouldn't be until the Renaissance that people would begin to question what lies beneath. It was about this time that the first "diving bell" was invented, which basically consisted of a barrel that rested on the divers' shoulders and was supported by slings. They were typically made of glass or wood though ultimately proved to be quite ineffective as they could only reach about 40 meters. Plus, the pressure from the water was damaging to the ears and sinuses of the divers. Record Distance Traveled: 3,028 ft.
Charles Beebe was a well-known adventurer who was contacted by Otis Barton in 1926 to embark on a deep sea expedition with him. Barton was from a very wealthy family and had already begun experimenting with underwater exploration in his youth. Before making contact with Beebe, he had already ventured the waters of Massachusetts with the help of his own make-shift deep-diving helmet and by weighing himself down with rocks. Barton sent Beebe detailed designs for the submersible he was working on and Beebe agreed to team up with him. 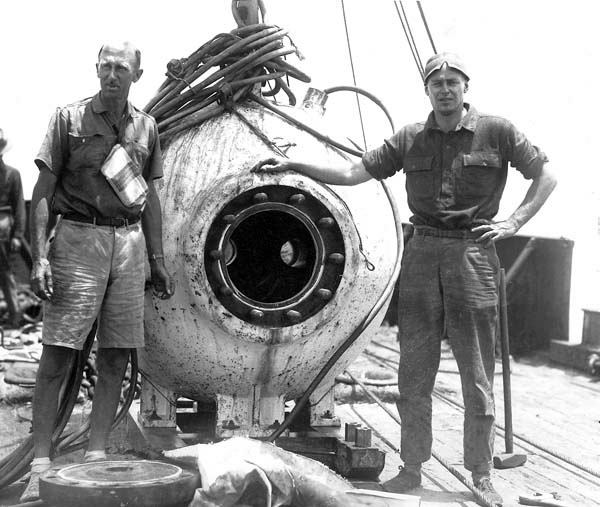 The two invented the bathysphere and from 1930-1934, their underwater chamber would progress steadily, reaching its pinnacle in the historic 1934 dive. The bathysphere (pictured above) was a 4,500 pound hollow steel ball that was lowered on a cord. It had 3 small portholes in the front, 1 larger hatch in the back and 2 oxygen tanks that carried 8 hours worth of air. The two inventors were able to reach a record-breaking 3,028 feet (1/2 mile) right off the coast of Bermuda, in their vessel. Beebe communicated with the surface by sending telephone cables to a ship above, transmitting messages about all of the new underwater life passing before their portholes. Although Beebe wished to remain at that depth to observe longer, the captain on the ship above would not allow this and pulled them up after five minutes. Beebe named several new species of deep-sea animals but these observations were met with controversy, some critics claiming that these fish were mere illusions. However, many of Beebe's observations from the Bathysphere have since been confirmed by advances in undersea photography. The record set during this dive remained unbroken until 1949, when Barton broke it with a 4,500 foot descent in a new deep-sea vessel he created called the Benthoscope. Record Distance Traveled: 35,800 ft.
Swiss Balloonist and inventor Auguste Piccard met Beebe at the Chicago World Fair in 1933. While Beebe was demonstrating the bathysphere, Piccard was showcasing his hydrogen-filled gondola. Beebe and Piccard quickly became friends and Piccard was soon inspired to modify his high altitude balloon so that it would use similar principles to descend into the deep ocean. This paved the way for the bathyscaphe, originally called the FNRS-2. He began working on it in 1937, but had to put his project on hold until after the Second World War. The FNRS-2 was completed by 1948. Unlike the bathysphere, the FNRS-2 was attached to a free-floating tank rather than being suspended from the surface. 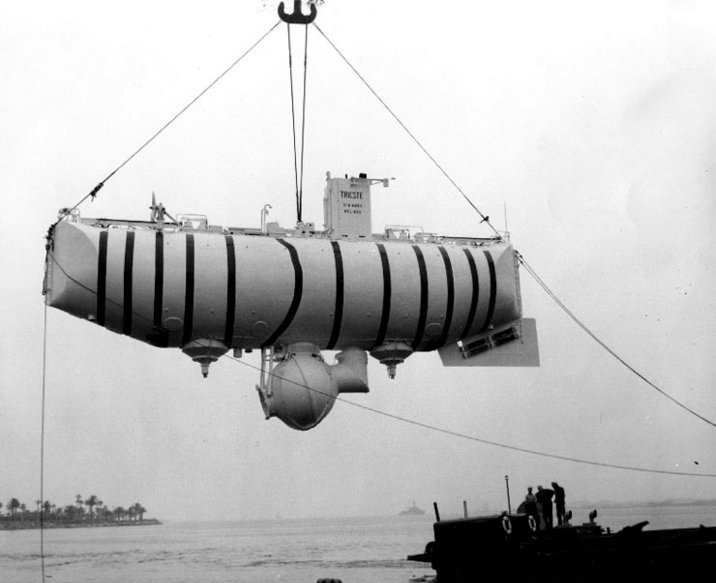 It was also referred to as the "submarine balloon" as it was designed to float in water just like a balloon floats in air. Its heavy ballast would allow it to sink to a desired depth when engaged, then rise to the surface when released (though initial sea trials were unsuccessful). Later on, Piccard and his son Jacques designed and built a new bathyscaphe, the Trieste. The Trieste consisted of a float chamber filled with gasoline for buoyancy, with a separate pressure sphere. The Trieste had nine tons of magnetic iron pellets placed on the craft as ballast, both to speed the descent and allow ascent. In 1953, they managed to navigate Trieste to a depth of 10,330 feet in the Mediterranean. The U.S. Navy then took an interest in the vessel and the Piccards sold the Trieste to them in 1958. The Americans made extensive modifications to the ship, equipping it with a new cabin to reach even deeper ocean trenches. On January 23, 1960, the Trieste set a new world record of 35,800 feet when it touched bottom in the Challenger Deep (the deepest point in the world's ocean) in the Mariana Trench near Guam. 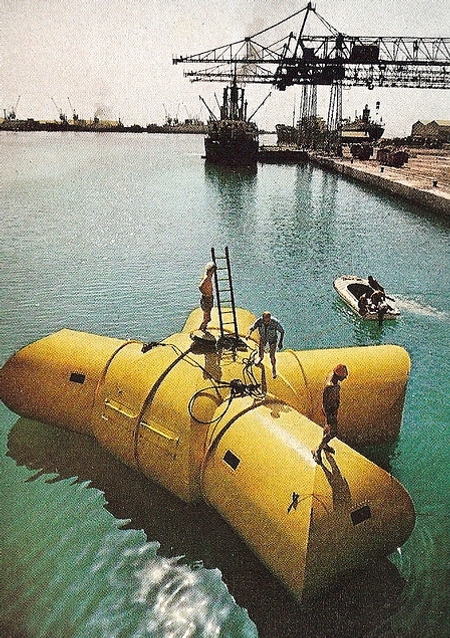 The submersible was manned by Jacques Piccard and U.S. Navy Lieutenant Don Walsh. Now that the depth race was over, the oceans were open to more thorough scientific exploration. The legendary ocean explorer, Jacques Cousteau, first served in the French Navy during the Second World War before sailing around the world on his iconic ship Calypso. During and after his time in the Navy he developed various types of underwater diving gear. 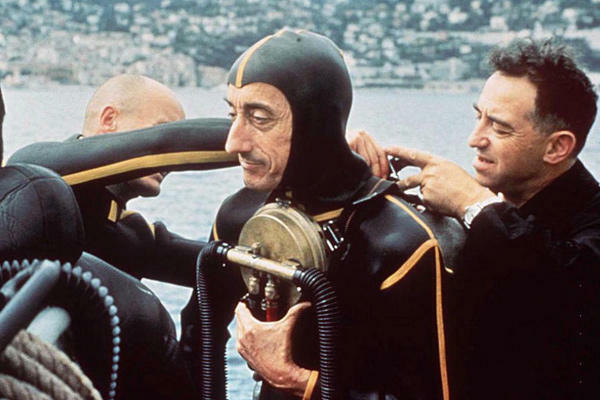 His most notable however, was the "Scuba" (which stands for Self Contained Underwater Breathing Apparatus) designed in 1943 with the help of Emile Gagnan. 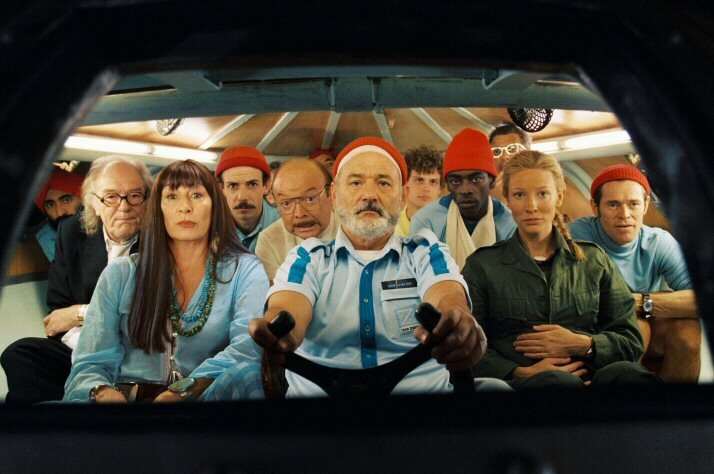 The scuba was originally called the Aqualung. In 1962, Cousteau created the first underwater habitat called Conshelf. A year later, the Conshelf II was built in the Red Sea near Sudan. 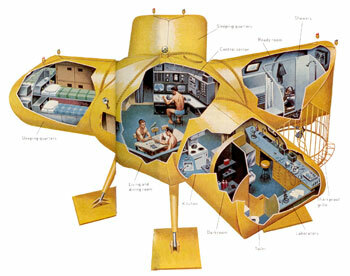 The underwater home was able to house 10 oceanauts who lived there for 30 days. In fact, a documentary about the project won Cousteau an Academy Award in 1964. As well received as the projects were, they were far too costly to continue funding and were eventually abandoned. 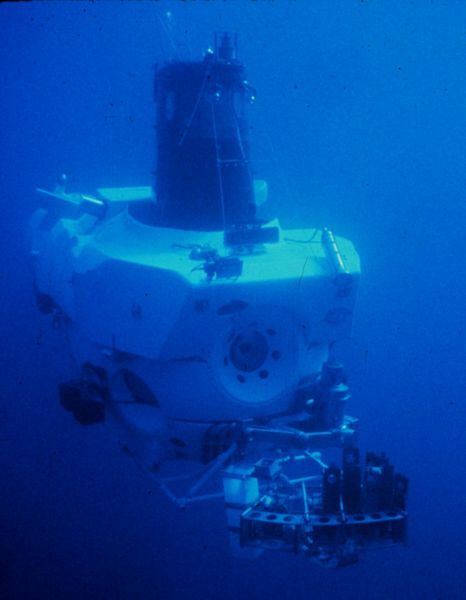 Alvin was built by General Mills' (yes- the cereal guys) Electronics Group was designed to be more efficient for deep-sea exploration. 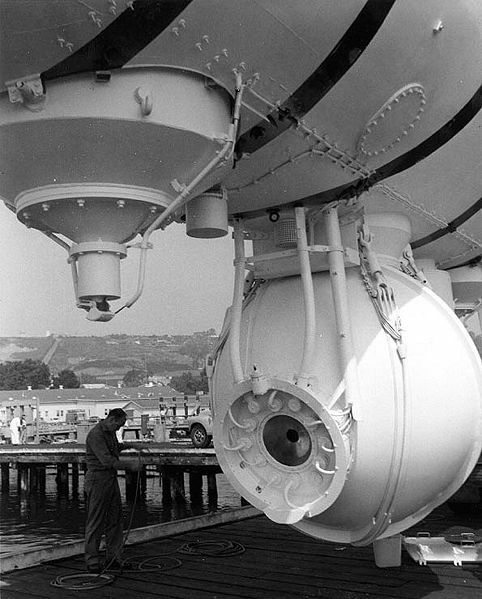 Owned by the US Navy and operated by the Woods Hole Oceanographic Institution in Massachusetts, Alvin was first tested in 1964 and has performed more than 4,000 dives since. The vessel can carry two scientists and one pilot, and can stay underwater for up to nine hours at 14,800 ft. In 1966, Alvin, together with a Navy robot, retrieved a hydrogen bomb lost in the Mediterranean after the collision of an American B-52 and a refueling tanker. Alvin has been part of many research projects, notably the discovery of giant tube worms on the Pacific Ocean floor near the Galápagos Islands. Though there have been huge advancements in the field of deep-sea exploration, the ocean's floor still remains a great mystery to us, with only about 2 percent explored to date. The deepest a modern submarine can go is around 20,000 ft below the surface. Virgin is currently working on a project called Virgin Oceanic. Designed by Graham Hawkes (who has built over 60 manned submersibles) the Virgin submarine is striving to be the first sub that will be able to withstand the extreme pressures of the deepest depths of our oceans and carry humans in the hopes of one day learning more about the mysterious waters that cover our great Earth. Wondering if you need a boat license or Pleasure Craft Operator Card to operate a submarine? You will likely still need to meet State recreational boating requirements as well as potentially needing a U.S. Coast Guard Master's license depending on the tonnage of the submarine.